Review copy provided by 5pb./MAGES. Well isn’t this a nice surprise! Out of nowhere 5pb. 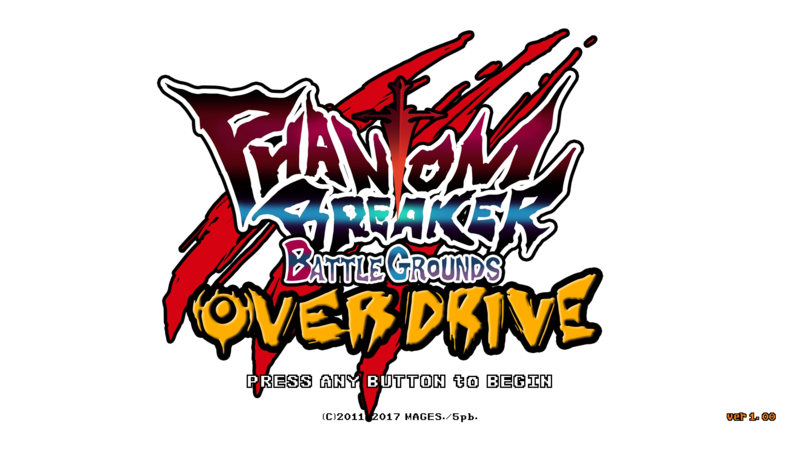 announced that they were porting the side-scrolling beat-em-up Phantom Breaker: Battle Grounds Overdrive to the Switch and be out in such short notice. This game was originally on XBLA (sans the Overdrive name) and later ported to Vita and PC, and then later to PS4 as Overdrive which came with paid DLC, alternate routes, and other enhancements. The Switch version actually is not only cheaper than the PS4 version, but now includes the DLC free of charge, but the alternate routes were omitted to prevent over complication (says 5pb.’s website). Another note is that like on PS4, the Switch version does feature online multiplayer… to be added in 2018 when Nintendo launches the paid online service, but the update will be free. So with that out of the way, how’s the game? Let’s find out! 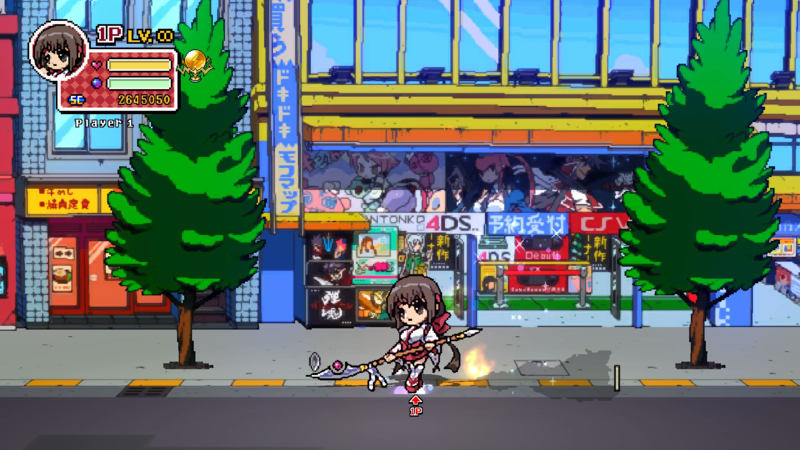 You start with a nice-looking 2D flash animated cinematic just to show off the game’s style, and featuring the adorable chibi designs of the characters! Once you pass the title screen, you’re given a menu where you can choose from options including a Story Mode, and Arcade Mode, etc. The game, including the story mode, features co-op for up to 4 players. You have a choice of 4 main characters, and also two guest characters from 5pb.’s other games Stiens;Gate and Robotics;Notes. 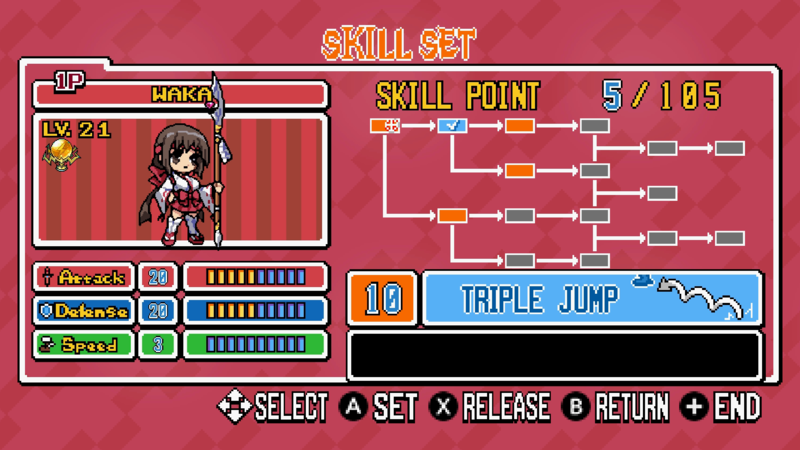 You can then choose between an Easy and Normal difficulty mode, with higher ones to be unlocked. 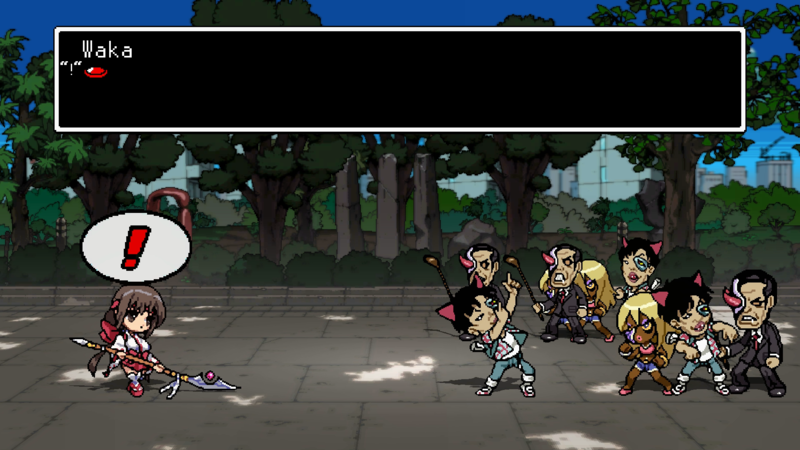 Once you begin, you’re given a text-based prologue with a narrator explaining the set up, and you then see a voice-acted (in Japanese-only) exchange in-game from the chosen character (in single-player only). Then the fun begins! 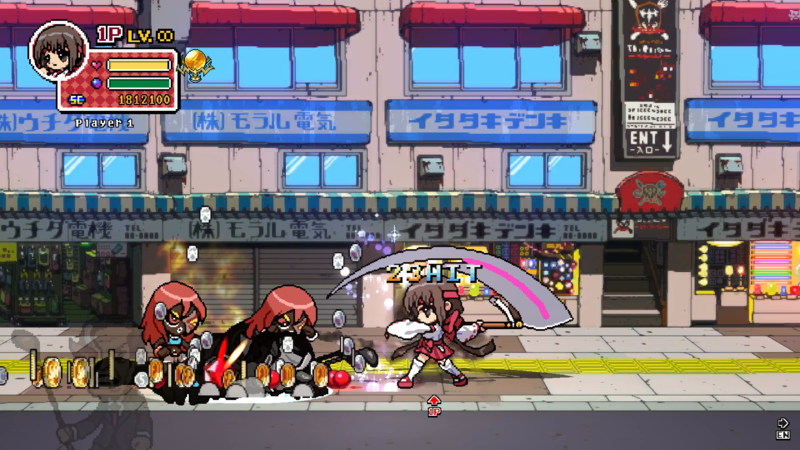 The game is a side-scrolling beat-em-up, and you have the choice between a quick attack, a medium attack, and a large attack. It’s most recommended going with the quick ones since the goal really is to start piling up combos by beating the crap out of tons of enemies at once and getting tons of loot in the form of coins and red gems. Coins are for points, while the red gems are your experience points awarded after the level is fully completed. You’re character has a health bar and a power bar. The power bar is more or less your typical Mana bar that is the fuel for your special attacks, one of which is pressing the medium and large attack buttons together. One such attack in this way is a lightning attack that hits most if not all enemies (it varies) and just gives you a LOT of coins for it, but not as many gems I’ve noticed. It’s the gems I’ve been personally after so I’ve grown to rely on the standard attacks to collect as many as possible. At the end of each level you fight a boss, and the first one was pretty easy (though much tougher than any of the grunts will be), but the one in the second level KO’d me each time. That’s quite the difficulty spike in my opinion. Luckily, even if you lose, you still gain the experience and level up with enough gems. You’re then taken to an upgrade menu where you’re assigned skill points. These are what leveling up awards you with. You spend these (but they can be adjusted later) to increasing your attack, defense, and speed. You can also gain new abilities and buffs in a skill tree for your points. As mentioned these can be adjusted freely, even the next time, so if you feel like removing defense to put your points towards more attack power or vice versa, you absolutely can! Presentation-wise, it’s adorable as can be. The designs coupled with the voice-acting are just put a smile on your face really. Music’s your classic chiptune stuff which sounds pretty good in my opinion! The game seems to run in full 1080p docked at 60fps, so you’re getting the best you can here, but I can’t help but notice the intro possibly has frame-pacing issues? It has an odd stutter I don’t notice during gameplay, and also it has a bit of compression going on (seems unneeded since it’s short, AND it’s an eShop game, so no cart size limitations to account for). Out now for the Nantonko 4DS! I find the combat to be lots of fun… if a bit tiring since it’s very much a button-masher and you’re doing so rather quickly. So I don’t recommend playing for long stretches if you tire out easily from quick repetitive button presses. But again, it’s really fun, just a shame about the difficulty spike, but bring your friends and I’m sure you’ll handle this just fine! Plus you can just grind in the first level over and over again and things will eventually move in your favor anyway! Overall, I highly recommend it. It’s cheap as can be at only $10 USD ($11 in Canada, we get an even better deal conversion-wise!). I’ve also heard it’s comparable to the Scott Pilgrim game from a while back, so if that was awesome to you, well let that help you decide also! + Adorable characters, fully voice-acted (Japanese-only), and the retro style looks great! + Music’s really good and goes well with the combat. + VERY cheap in price, a legit terrific value, especially compared to the PS4 version. + Runs 1080p and 60fps docked, always appreciated. + Supports 4 player co-op and multiplayer local and online… well the latter will be when Nintendo opens the paid service. + Combat’s quick and fun. Very satisfying. + It’s also really fun to quickly collect the loot while fighting, and tons of it can show up when you get a good combo going! – Lots of button mashing, be wary about playing for long stretches. – It starts out easy enough but then when you get to the second boss it gets REALLY hard. – One of the grunts in the second level throws pies at you and it’s quite hard to reach him without constantly getting hit. – The alternate routes from the PS4 version are omitted.